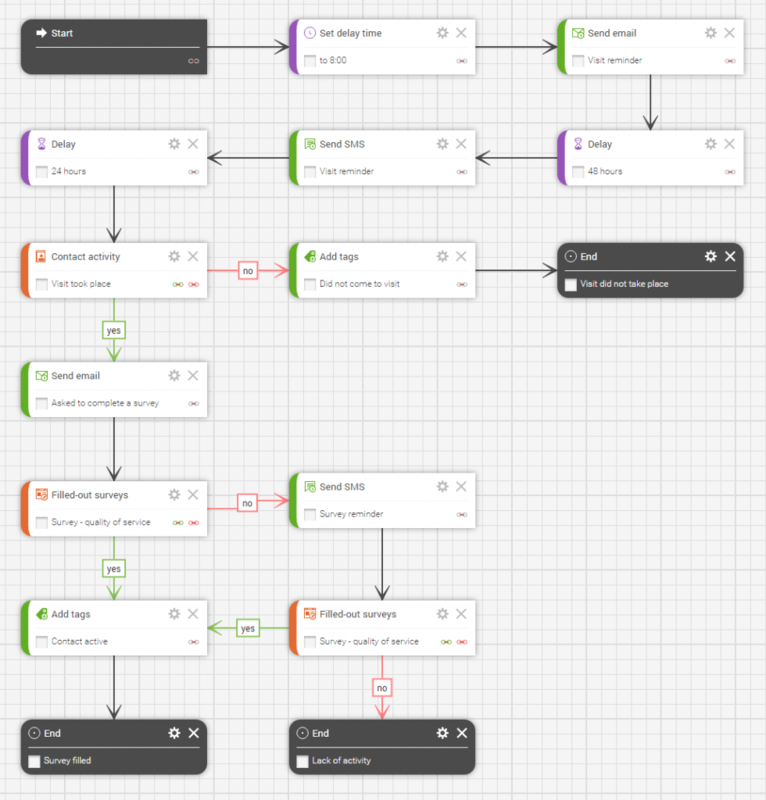 How to use Marketing Automation scenario to remind your client about an upcoming visit? 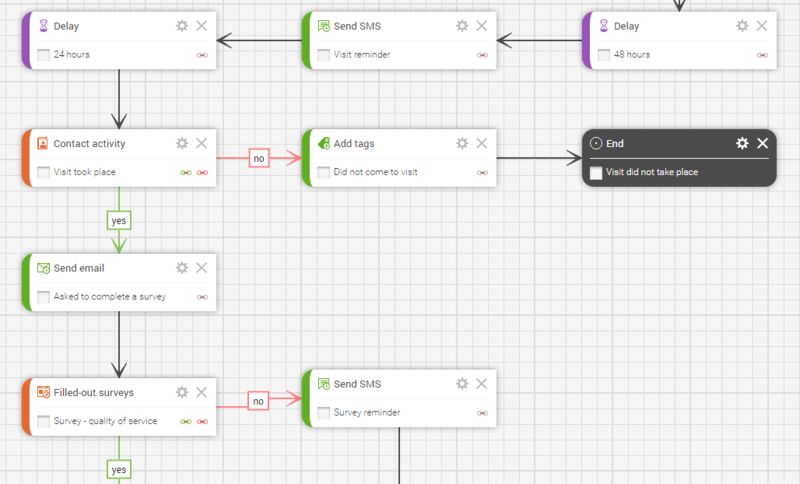 Marketing Automation scenarios in iPresso may be used to automatically remind your clients of their upcoming visits (e.g. in healthcare), checkups (e.g. at an automobile repair shop) and any other appointments. The following scenario created in iPresso depicts the scheme of communication with patients that is used by a dental clinic. Possessing information on the date of the visit and patient’s contact data, iPresso will automatically remind him or her about the appointment and after the visit it will ask the patient to complete a survey about service quality. Let’s assume that a piece of information about a visit planned for April 15 is entered into the system. The first email reminder may be sent e.g. two days before the visit – in this case it would be on April 13. The scenario also contains a delay block, so that the messages are to be sent at 8 o’clock and not during the night. The next reminder – this time a text message – is sent after 48 hours, i.e. on the date of the visit, also at 8 o’clock. Further actions carried out by the system depend on whether the patient actually turns up for the visit. If a doctor confirms (during the next 24 hours) in the system that such activity occurred, the system will send the patient an email asking to complete the service quality survey. If the patient doesn’t turn up (there is no confirmation of such activity) – the system will automatically add a proper tag (Did not come to visit) and end the scenario. In the case of the patients who complete the surveys a different tag will be added (e.g. Contact active) and then the scenario will also end. If the survey is not completed right away, the system may send an SMS reminder to ask for its completion. If it is completed by a patient after sending of such reminder, the tag Contact active is also added. If it is not completed – the scenario ends. It is enough to design just one such scenario to automatically manage all the patients!